WhiMSy love: Happy Mardi Gras Day! 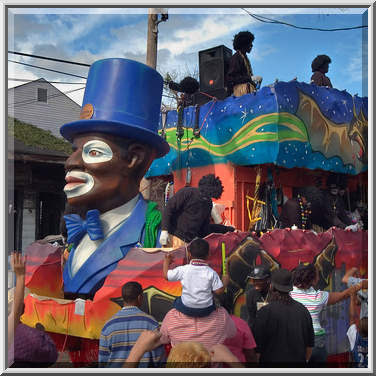 A lot of my childhood was spent growing up outside of New Orleans, Louisiana & it is such a HUGE thing down there to celebrate with Carnival, large parades, & other festivities. I have so many fun memories of Mardi Gras as a kid. I remember going with my neighbor friends & all our families to local parades--empty pillowcases in hand to catch all the beads, cups, doubloons & other loot. "Throw me somethin' mister! ", we'd shout. On one Mardi Gras (in 1985 or 1986? ), my family went to the famous Zulu Parade--the oldest African-American parade. The pride & prize of this parade was to catch one of their golden coconuts. (This tradition of throwing coconuts began its carnival adventures in 1910!) 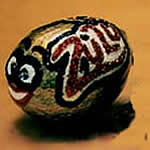 It was a coconut painted gold with other glittery designs. Well, I was sittin' on my dad's shoulders & one of the masked & costumed men riding in the large decorated floats reached down & handed me one!! I felt like a kid in a fancy golden coconut store! I kept the coconut for a very long time. I have no idea where it ended up, but I'm thinkin' maybe mom had something to do with its disappearance. Or maybe my brother & I tried to crack it open & eat it? One time I got seperated from my parents in the large crowds of people at a parade. It was JAM packed with loads of bodies. I was a little 10 year old white girl lost in a black neighborhood & my mom was yelling, "NIKKI! NIKKI!" Everyone around knew exactly who this little white girl belonged to---that even whiter lady. HAHA! And OH how I miss king cakes! I love the history of it all--even the king cake, which had its beginning with the first French settlers. It is basically a twisted cinnamon bread-or coffee cake-decorated with icing & purple, yellow & green sprinkles. A little plastic baby is hidden inside & if you get the piece of cake with the baby, you are declared the "king" or "queen" for the day. It also means you have to bring the next king cake or throw the next party. Every year our school classes would always have king cakes & I got the baby on more than one occasion. Oh, isn't Mardi Gras in New Orleans fun? I haven't been in years, but I'll never forget it. And I think there are still some of those beads hiding in a box somewhere. I've never been to Mardi Gras. I do understand Shrove Tuesday and Lent however. Tomorrow it's back to a low fat vegan diet for my lent! Some years before I went in Nice Carnival and 12 years ago In Venice. Great memories. Hope to go in New Orleans and in Rio. Thanks for sharing. I saw your stunning and funny forks . You are really inspirede. Ay-yeeeeee! Happy Mardi Gras! Come over and have a slice of my king cake. We haven't found the baby yet, so there's still a chance it's yours!! Thanks for stopping by, nice meetin' ya! I grew up in Metairie, one year a teacher had us make a float out of a shoebox. Can't remember what mine looked like but it's one of those sticky memories that "float" throught my mind every year about this time. I make boxes & I've been thinking about making one as a Mardi Gras float. If I ever get around to it I'll try & remember to send you a photo. How fun. I fogot it was Mardi Gras! Cool! I didn't know you grew up in my neck of the woods. I wonder, do you have a southern accent? I lived in N.O. for a time off Esplanade. Love it...miss it.